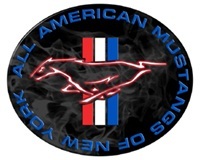 this show is something we always enjoy and its also the 52nd birthday of the mustang, and a new thing this year is the national mustang day celebration. bring your cars and enjoy this day as a club.st. patricks is supposed to have a one of a kind stang at the show. come check it out.